Printer Refillers has been serving Canada since 2002 with tens of thousands of happy customers. We use over 100 printer specific inks with over 20 different black inks insuring ink compatibility. • We have been filling ink-jet cartridges since 2002 and have invested tens of thousands of dollars into research and development. 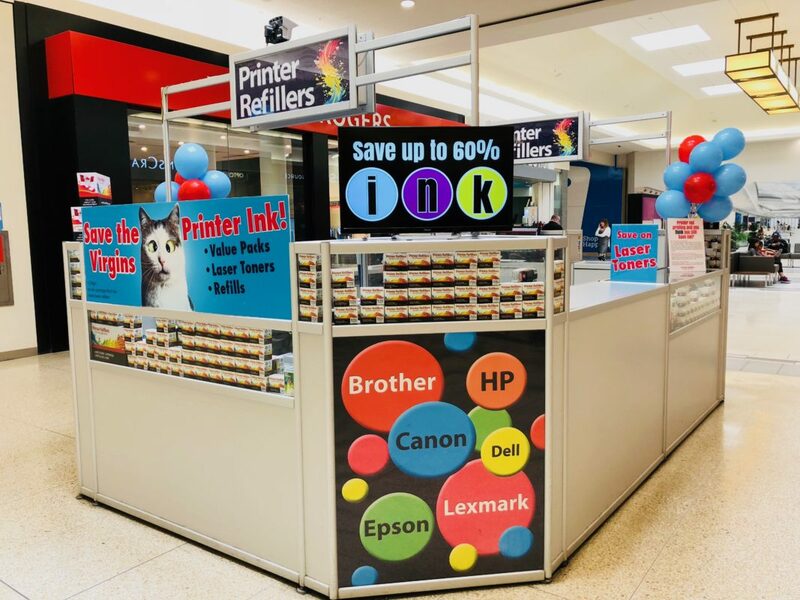 • We carry 100 different printer specific inks with over 20 different black inks insuring that cartridges do not leak or clog your printers print head versus generic inks that may clog and fade over time. • Our technicians understand why your cartridge is working or not working and have the tools avail- able to them to fix them. • Same day service most refills done in 30 minutes! • Hand filled insuring delicate cartridges are cared for, resulting in low failure and return rates. • In store testing and cleaning. Ultrasonic Cleaner up to 5 minutes, hand cleaned print head Atomizer, Vacuum Cleaner, Nozzle Flush and Centrifuge to clean out dried ink cartridges and specialty liquid cleaners. • All major brand including compatible and remanufactured cartridges not available everywhere. • Hundreds of thousands cartridges refilled! Facts about machine filled cartridges. Walmart tried it and failed! Hand filled cartridges work better! Hand filled cartridges can have extra ink added to them, up to 50% more, when possible. We carry over 100 printer specific inks formulated to match manufacture’s inks, compared to 20 odd inks carried by machine filled cartridges. Hand filling cartridges succeed where machine filling cannot. Knowledgable trained technicians can rescue cartridges that would be deemed “unfillable” by automated filling systems. If you want quality filled cartridges, hand filled cartridges are the only way to go. With Printer Refiller’s the cartridges can be cleaned of all old ink residue so that it will not clog the microscopic print nozzles. With Printer Refillers ink is formulated to be chemically compatible with the diverse technical requirements in the different print systems, to flow & eject effectively throughout the complex and highly tuned components. Printer Refillers has spent thousands on research and development, finding the right mix. At Printer Refillers we have faced some tough competition; Cartridge World, Walmart, & Inkjet Plus. All of our competitors have gone, and we are still serving thousands of customers in Winnipeg and across Canada. We take particular care of your cartridge needs and will continue to do so! We are a small business and it has sometimes been challenging to come up against large corporations who can offer a fraction of this service as a lost leader to get people into their stores, However, if you are looking for someone who will make sure your car- tridge is properly matched with the right ink, filled to optimum levels, cleaned and maintained so that it can handle many fillings, then you need to choose Printer Refillers. We care about our product, we are proud of our service and the skill of our technicians. To all of you, from all of us at Printer Refillers- Thank you and Happy Printing!